Earlier this month I attended the AICPA's annual Personal Financial Planning Conference, which my dad and I both attend just about every year. This year we were both speaking at the conference in addition to attending the many informative sessions. This conference has been hailed as the top financial planning conference in the country for technical content and I'm proud to have been a part of it for as long as I've been doing financial planning work. I'm often asked why we are willing to put so much of our time, energy and money into speaking and attending conferences. The reason is that everything I put in has always come back to me tenfold in the knowledge I take away, connections I make, and ideas I hear for improving the services we provide our clients. I am a firm believer that it's important to never stop learning and to constantly challenge your existing beliefs with new information. We don't implement every idea we come across and we don't change our methodology and processes every time we see something new and different. But it is important to be exposed to these new ideas. 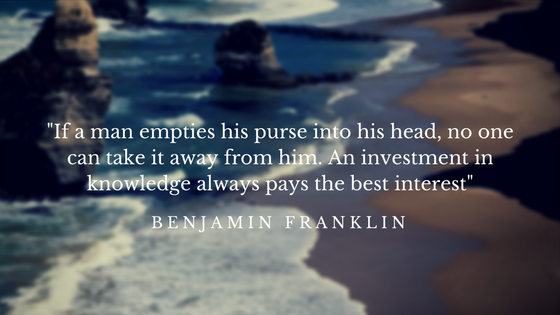 Our approach is the same in both our investment philosophy and the way we help clients develop a financial plan. It might at times seem boring since we aren't always coming to clients with shiny new ideas and strategies. That doesn't mean we aren't doing the due diligence and keeping on top of developments in our field. As boring as it might seem, we believe the best strategy is often, "Don't just do something, stand there!" Building a Financial Planning Services Business - This was the two day presentation for which I served as a panelist, along with 5 other CPA financial planners from around the country. The great thing about this session is that I got to learn from the other panelists as much as the attendees learned from us. Seeing how other planners have structured their business and how they work with clients is incredibly helpful as we seek to provide the best service to our clients. Implementing Financial Life Planning - We strive to develop deep and lasting relationships with all of our clients. Typically when someone comes to us for advice, they want a quick answer to a pressing financial issue. However, the only way we can truly provide good financial advice is to know and understand our clients and how the decision will impact them. Life planning is an approach to developing much deeper relationships between clients and their advisors, with the finances being just one component of that relationship. This panel of experts shared some great ideas on how they've implemented life planning services and I took away some useful tips to use in our practice. Planning at the Cliff of a Client's Capacity: As many of our clients grow older, we know that some of them will unfortunately have to deal with diminished mental capacity at some point in their lives. This is a very difficult situation as we have seen in our own family in recent years. We are always looking for the best ways to help our clients deal with this. This session pointed out some of the things to look for in older clients and some best practices to make sure we understand our client's true desires are known well before they encounter such issues. A Debate: What is the Key Driver in Helping Clients Reach Their Goals - This was an interesting panel debate among three well respected financial planning researchers who each had their own opinion on what we should focus on the most with clients to help them reach their goals. The three areas discussed were fund/manager selection, optimizing asset allocation, and influencing client behavior. I came away more convinced than ever that behavior is the key driver to reaching your goals. Crossing the Generational Divide - Unlocking the Power of Generations to Grow Your Business - I had never heard of Jason Dorsey prior to this presentation but based on the content and the title of his book, I was afraid it was going to be yet another talk about millennials and how to deal with them (us). Instead I spent a solid hour laughing at his hilarious anecdotes that really hit home, especially sitting next to my boomer dad! I highly recommend you watch his TED talk. The Best Estate Planning Ideas - Bob Keebler is one of the top estate planning experts in the country, and a personal friend of ours, so it's always great to hear his latest estate planning ideas, especially in light of potential tax reforms. I could write a book on this session alone and we'll incorporate his thoughts into a future blog post. The Impact of Dynamic Approaches on Optimal Retirement Income - This session by Morningstar's retirement researcher, David Blanchett, was a fantastic summary of some of the recent research on dynamic withdrawal strategies in retirement. A dynamic withdrawal strategy means instead of planning your retirement income to be a fixed initial amount, that is adjusted for inflation each year, you adjust your income each year in retirement based on some other factors. There are many approaches to this, including taking a spending cut when the market drops or planning to spend more in earlier years and less in later years. Our current retirement planning models are not sophisticated enough to handle some of these more complex strategies but they are catching up and I believe a dynamic approach to retirement withdrawals will become the norm in the future. The End of the World and Other Opportunities - This was a rather scary presentation by geopolitical strategist Peter Zeihan, who wrote a book titled "The Absent Superpower - The Shale Revolution and a World Without America." Peter makes the case the changing world economy might lead to disorder around the globe, but the US is actually well situated to withstand these changes. It was a fascinating presentation and his book has been added to my summer reading list! Retirement Panel - This session, moderated by my dad, was a great update on many areas of retirement planning. For more details on this one check out his blog. This isn't a comprehensive list (I left out Mr. Wonderful from Shark Tank! ), but hopefully it gives you a sense of what exactly we do at these conferences. It might surprise some of you to learn we are in these presentations all day long - 7am-7pm! Unlike some other professional conferences we aren't out golfing or spending hours at the blackjack table. We go to learn and the learning doesn't stop when we leave, I finished a book about quantitative momentum investing on the plane ride home!